1. How do Airedale Terriers get along with other dogs and cats? Raised as puppies with other dogs and cats, our dogs do very well. 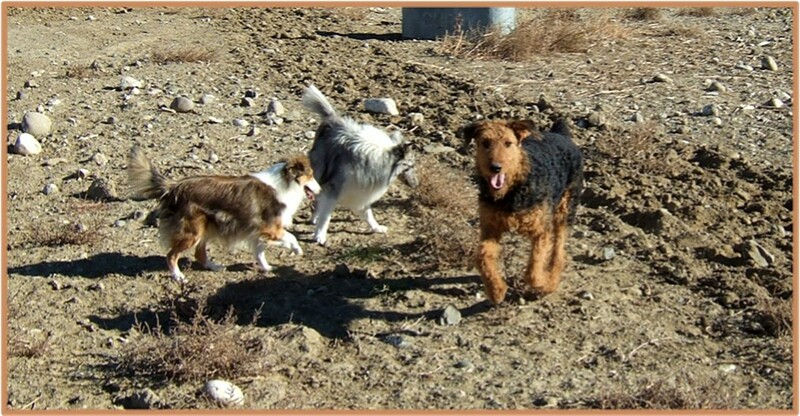 We have several shelties and Airedales who have become the best of friends and playmates. Our Mariah acts as Peanut's (sheltie) bodyguard. 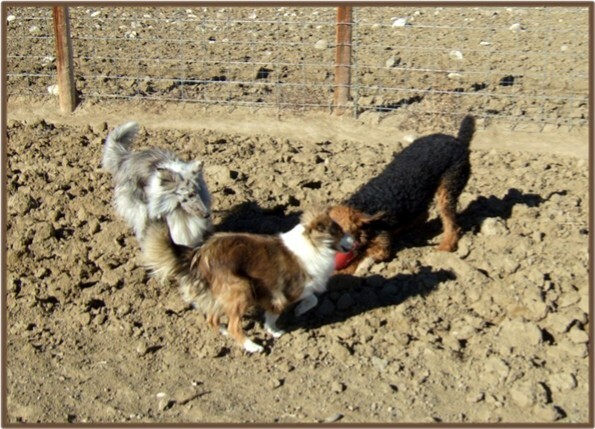 The photos below are of Miley playing with our shelties, her beloved little friends. Male Airedales generally get along best with female Airedales and vice a versa. Gradually socializing your puppy with your friends, relatives, and who ever regularly visits your home is generally a good idea. 2. How do Airedales interact with children? Raised as pups with kids, they do great with them. The Airedales do become protective of their entire family, especially the younger children. Many of our pups have been placed in homes with young children whom they bonded with closely. 3. How often should an Airedale's coat be clipped or hand stripped to maintain a tidy appearance? This is rather dependent on the individual dog's coat, weather conditions (will the dog be outdoors in the winter), etc. Most look best with a trim about once or twice a year. The Airedale exhibits a "broken coat" like that of many terriers. This consists of a rather wiry coarse topcoat with a soft more fur-like underlayer. Our dogs possess a variety of coats ranging from shorter and straighter (minimal maintenance) to long, soft, and very curly needing more frequent trims. Shown on the Red Airedales page, the red Airedales as well as several of the black & tan dogs (including Miley above) have never been clipped - Neither has Miss Abby on the bottom of our Home page. Having soft curly coats (sometimes referred to as "lamb's coat"), Fancy Girl and Mariah (black Airedale in photo below) must be trimmed at least once a year to avoid resembling wooly beasts. Although more time consuming and labor intensive, stripping the coat offers several advantages over clipping. Utilized by most Airedale show breeders, a small serrated knife is utilized to detach loose hairs and follicles. Clipping leaves these hairs and connected follicles, etc. intact which would normally molt out. Some suspect that this may soften the coat somewhat with possible fading. Others further believe that this may lead to a higher incidence of skin allergies; unfortunately, no hard data is readily available on this topic. Regardless, regular brushings greatly enhance the coat's appearance. If kept trimmed and groomed, shedding is minimal to nonexistent. As discussed above, certain coat types require less maintenance. We advise to please avoid excessively bathing the pups. Dogs do not perspire like humans or horses and too frequent baths will dry out their skins leading to irritations. 5. Are Airedales active dogs? While highly playful, Airedales are active, not hyperactive. 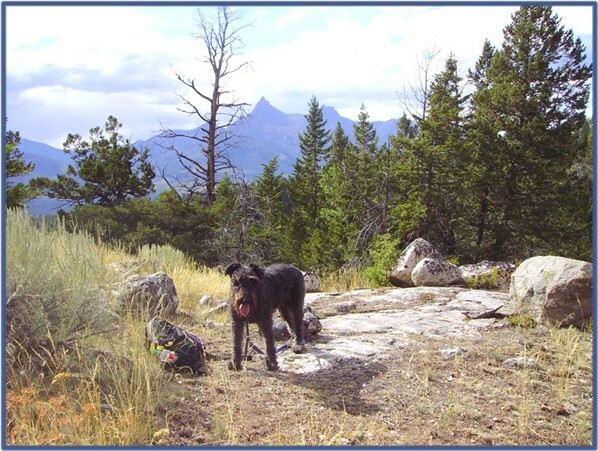 They love to romp, play, and go for hikes. They also like rest periods for napping and lounging around. The breed does have a tendency to dig. Basic puppy obedience classes are a good idea to teach both you and your dog. Airedales are stoic and generally do not show any signs of pain unless something is very wrong. 6. How long does it take for the pup to grow to full size? In general, the larger Airedales take longer than the smaller ones. Our large males may require over two years to reach full maturity. They typically reach full height by around 1.5-2 years, but may continue broadening for another year or so. Our large black Airedale, Roc, weighed around 80 pounds at two years old, but reached a solid 95 pounds by the age of three. 7. How much do the puppies cost? Do you ship? As a general policy, we do not provide our Airedale prices over the internet. We apologize for this inconvenience. This is because we have had several breeders contact us under false pretences. These individuals typically give out false identities, non-working phone numbers, and alternative email addresses. Please phone us at 307 754-3426 for prices and much more additional info on our Airedales. Carl will be happy to answer your questions. References are available upon request. Yes, we do ship via airline, although this can be difficult in the summer due to the hotter temperatures and heat restrictions enforced by the airlines. In order to ship a puppy, we must provide the airline with a health certificate from our vet, the vaccination record, and a crate of appropriate size. There must be sufficient room for the puppy to turn around and his or her head is not touching the top. The airlines also require the physical address and phone number(s) of the new owner picking up the pup at the airport. Depending on the airport, we must check in with the pup 90 minutes to 2 hours prior to scheduled departure. The new puppy owner picking up the pup often will have to show a drivers license or some other form of acceptable ID. We also frequently meet people who wish to pick up their pups at mutually agreed upon locations. High Kountry Airedales provides clients with 5-6 generation pedigrees and health records.